“Market volatility has picked up again over the past few weeks. Headlines highlight risks regarding interest rates, the Fed, China, house prices, auto sales, trade wars, and more. Uncertainty abounds. But doesn’t it always? I have no view on whether the recent volatility will continue for a while, or whether the market will be back at all-time highs before we know it. I remain focused on preserving and growing our capital, and continue to believe that the best way to do so is via a value-driven, concentrated, patient approach. I shun consensus holdings, rich valuations, and market fads, in favor of solid, yet frequently off-the-beaten-path, businesses run by excellent, aligned management teams, purchased at deep discounts to intrinsic value,” are the words of Maran Capital’s Dan Roller. His stock picks have been beating the S&P 500 Index handily. We pay attention to what hedge funds are doing in a particular stock before considering a potential investment because it works for us. So let’s take a glance at the smart money sentiment towards Banco Santander, S.A. (ADR) (NYSE:SAN) and see how it was affected. Hedge funds grew more confident in Banco Santander, S.A. (ADR) (NYSE:SAN) during Q2, as there was an 18% jump in hedge fund ownership. One of those new investors was billionaire Israel Englander’s Millennium Management, which bought just over 200,000 shares during the quarter. 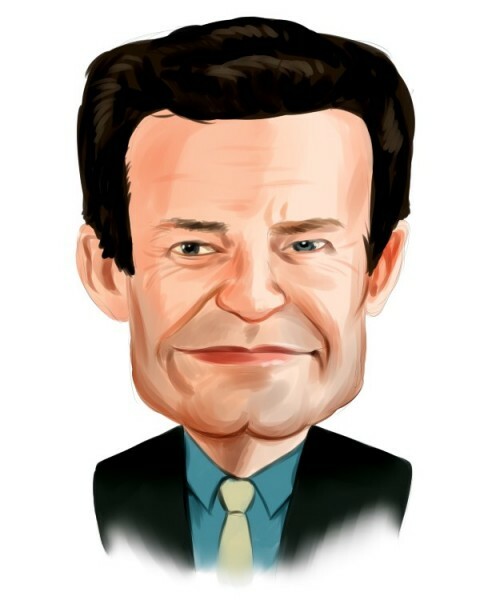 The Spanish banking group also ranked 22nd on the list of 25 Dividend Stocks that Billionaire Ken Fisher is Bullish On, as it carries a 3.27% dividend yield after its dividend was raised by 4.5% earlier this year. In today’s marketplace there are a large number of indicators stock traders have at their disposal to assess stocks. A couple of the best indicators are hedge fund and insider trading sentiment. Our researchers have shown that, historically, those who follow the top picks of the best fund managers can outperform their index-focused peers by a healthy margin (see the details here). At Q2’s end, a total of 20 of the hedge funds tracked by Insider Monkey were long this stock, a jump of 18% from the previous quarter. 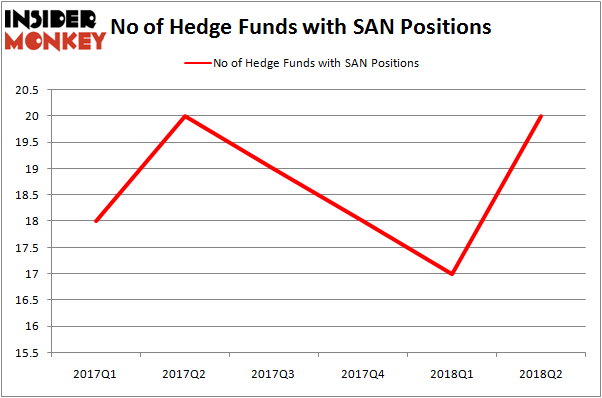 On the other hand, there were a total of 20 hedge funds with a bullish position in SAN in the middle of 2017. With the smart money’s sentiment swirling, there exists a select group of key hedge fund managers who were upping their holdings meaningfully (or already accumulated large positions). The largest stake in Banco Santander, S.A. (ADR) (NYSE:SAN) was held by Ken Fisher’s Fisher Asset Management, which reported holding $497.2 million worth of stock as of the end of June. It was followed by Renaissance Technologies with a $78.9 million position. Other investors bullish on the company included Masters Capital Management and Ariel Investments. As aggregate interest increased, specific money managers were leading the bulls’ herd. HighVista Strategies, managed by Andre F. Perold, established a new position in Banco Santander, S.A. (ADR) (NYSE:SAN) worth $0.1 million at the end of the quarter. Mike Vranos’ Ellington also initiated a $0.6 million position during the quarter. The other funds with new positions in the stock are Glenn Russell Dubin’s Highbridge Capital Management and Peter Rathjens, Bruce Clarke and John Campbell’s Arrowstreet Capital. Let’s now review hedge fund activity in other stocks similar to Banco Santander, S.A. (ADR) (NYSE:SAN). We will take a look at Lockheed Martin Corporation (NYSE:LMT), American Express Company (NYSE:AXP), Morgan Stanley (NYSE:MS), and Thermo Fisher Scientific Inc. (NYSE:TMO). This group of stocks’ market values are closest to SAN’s market value. As you can see these stocks had an average of 47 hedge funds with bullish positions and the average amount invested in these stocks was $6.89 billion. That figure was $749 million in SAN’s case. Thermo Fisher Scientific Inc. (NYSE:TMO) is the most popular stock in this table. On the other hand Lockheed Martin Corporation (NYSE:LMT) is the least popular one with only 33 bullish hedge fund positions. Compared to these stocks Banco Santander, S.A. (ADR) (NYSE:SAN) is even less popular than LMT. Considering that hedge funds aren’t fond of this stock in relation to other companies analyzed in this article, it may be a good idea to analyze it in detail and understand why the smart money isn’t behind this stock.